Growing up, it was a Christmas tradition to eat sausage and egg casserole on Christmas morning. My mom would make it every Christmas Eve and leave it in the fridge overnight, ready to hit the oven in the AM. While sausage and egg casserole basically tastes like the holidays to me, I have a little confession: I don't really love it. Sorry, Mom! Hope you aren't reading this! Not only am I not a huge fan, I know my three year old and husband won't be super into a spicy sausage egg bake either. And this year, we'll be in our own little house, just the four of us, on Christmas morning so I wanted to find a casserole dish that I can prep the night before if I want or with little effort on Christmas morning. I couldn't find just what I was looking for, so I made one up! 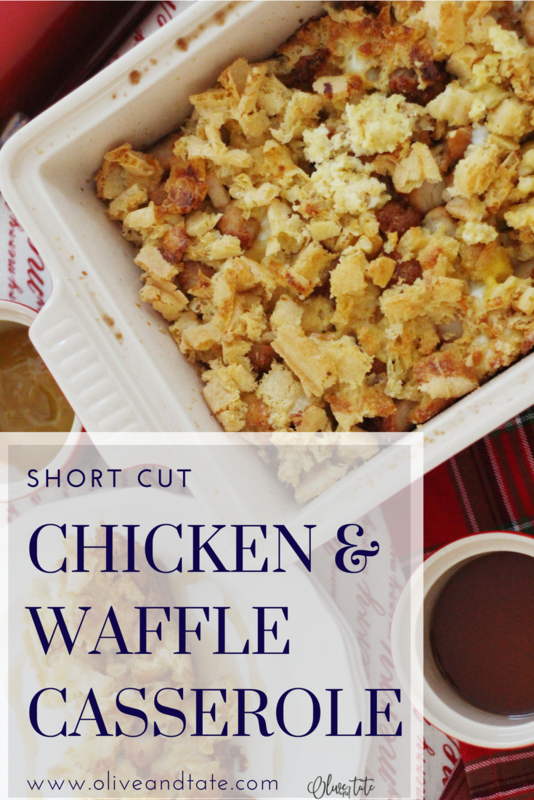 Behold, Chicken and Waffle Casserole - perfect for Christmas morning, New Years Day, brunch or just because! add another layer of waffles, then nuggets and top with waffles! In my oven, it took 45 minutes for the center to become firm. Serve with maple syrup poured over for those who love it sweet or with a side of honey mustard for those who love to dip! This was a hit with my husband and three year old so I think we'll be making a tradition out it!